Sailors and power boaters, sports enthusiasts and fishers, school girls and stockbrokers, children and grandparents all share a fascination with the sea, with yachting, and with the adventures yachting makes possible. Whether "sailing away from the safe harbor" is a sentiment expressed by Mark Twain or not, generations of young people and thousands of families seem inspired to do just that each year, and the words, "Explore, dream, discover," become a prime directive. Deciding to buy a yacht is seldom an impulse purchase, even though the "Honey, let's buy a boat" syndrome is a very real phenomenon that manifests at boating shows and during summer weekend outings with friends. More than 88 million adult Americans participated in some sort of recreational boating activity in 2013; while that number includes all type of vessels, from canoes and kayaks to cabin cruisers and large yachts, the numbers are staggering, and they increase each year. Reality, however, dictates that as a serious search for a suitable yacht progresses, potential buyers will focus on the process, developing a decidedly personal "wish list." Yacht ownership varies greatly, from trailerable speedboats to blue-water yachts, from simply equipped center-consoles to luxurious sportfishing vessels, and from easy-to-operate outboards to captained mega-yachts with full-time crews. How should you go about finding the one that perfectly suits your needs? Dreaming about your yacht - and finding it - are two different things. While the process can, in some ways, be compared to looking for a home to buy, there are important differences. First, and perhaps most importantly, the perfect boat for you may be located half a continent away. While location may be everything in terms of falling for a home, boats can be moved, sometimes quite easily. However, you should also be aware that certain boats are popular in specific locales for good reason. Secondly, while care and condition of a yacht are important, it is the mechanical parts that are vital as well. Try to look beyond the "pretty face" of any vessel you consider: Examine, instead, the working parts - the engine, generator and props, the electronics and the mechanical components such as fuel, water and holding tanks, and the space below decks; not only accommodations, but also engine compartment and on-board storage. Finally, safety on the water is all-important. Weekend boating on a lake, canal or the Intracoastal Waterway is quite different from planning a trip across the Gulf Stream to the Bahamas, or embarking on a 21-day cruising adventure to the Keys. When you are in the market for a boat, it is wise to get your family or your intended companions "on board" with the kind of boating you envision. The social aspect of boating is one of its more important benefits; it helps if your favorite people share your enthusiasm. Whether you purchase a new model yacht from a brokerage, have one custom-built for you or invest in a pre-owned vessel depends on your budget, your personal preferences and the degree of personalization and specialization you require. As with automobiles, a new yacht's value is decreased with its first voyage on the water. If you are motivated only by the financial deal you can negotiate on a yacht, your best course of action is probably to look for a pre-owned model that meets your needs. Engine hours are the determinant of yacht use and affect pricing to a much greater extent than model year. 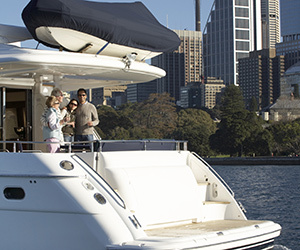 Pre-owned vessels offer some advantages. Previous owners may have customized their yachts with electronics and communication equipment, or a dinghy, life raft and "toys" may be included in the sale. Examine installed chart-plotters, radar, depth-sounders, fish-finders, radios and emergency equipment carefully to be certain that all meets current standards. Consider interior decor as well as exterior trim. Many pre-owned yachts are used "gently" and as long as the maintenance records are complete and the vessel has been appropriately serviced, financial savings can be impressive. New models, however, are tempting. It is a very personal decision.